Athens is a small town in Henderson County with a population of about 13,000 citizens. Monkey Bridge is located on Meredith Road near Athens, Texas. 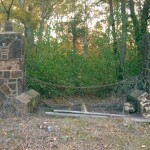 Monkey Bridge is just one of several locations with a dark history in Athens, Texas. According to one source online, Athens was founded by a group of satanists who were trying to found a community where they could freely practice their religious beliefs. Whether this is true or not, is entirely speculative. However, in recent years, evidence of satanic activity has surfaced in the community. 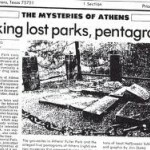 The tale of Monkey Bridge is connected tenuously to the stories told in Athens, many of them related to animal sacrifice and evidence of rituals (including the dead animal carcasses left from the sacrificial rituals) that have taken place at the “monkey cages” in Fuller Park. Finding hard-core data about the place is difficult, but forums seem to indicate that Fuller Park once included a zoo, complete with monkeys. Some locals claim that monkeys escaped a harrowing circus train crash and that their spirits haunt Monkey Bridge. This tale sounds familiar to a story told in Weeping Water, Nebraska about a place called Monkey Mountain. In this story, a circus train crashed and monkeys escaped, making their home in a little grove of trees on top of a hill (there are no mountains in Nebraska). Another story in the United States with a “circus-element” to it is at Bell Bottom Bridge in Marlin, Texas. The ghost stories told about this place are a hybrid between Cry Baby Bridge lore and Circus Train lore. Sacrificial rituals purportedly have taken place at Monkey Bridge as well as at Fuller Park. Believe it or not, this is not the only place in the United States where a circus train wreck supposedly took place. Check out Monkey Mountain in Weeping Water, Nebraska where locals tell similar stories about monkeys getting loose from a circus train wreck and running off into the trees. Do YOU have more information about this place? If you have information about this haunted place... ANY information, please fill out the comment form below so we can include the information in our database. !! **>> If you would like to become a contributor or editor of the site (where you get your name or group name on the site, can upload videos, photos, create new listings etc. ), please sign up using the link at the top of the page... then, send us your username and a bit about yourself (why you would be good at editing Hauntin.gs, for example) and we'll get you started. New haunt info in your email!